Looking for a local eye doctor & optometrist in Williamsville NY? Call us today! Get in touch for your free corneal reshaping evaluation today! Just fill out the form and we'll contact you to schedule your appointment. 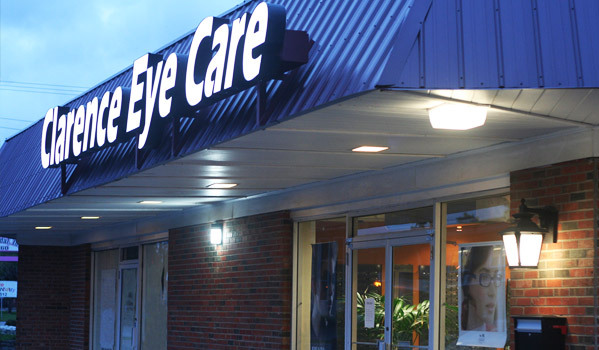 Looking for quality eyecare in Buffalo? Tonawanda? Amherst? Cheektowaga? Lockport? Clarence? Kenmore? We have built a reputation of consistancy & quality with our customers. It all begins with a commitment to you, the patient. Clarence Eye Care, serving the greater Buffalo area, adheres to the highest standards of quality and a firm commitment to our patients. Our goal is to educate each patient, to ensure you make informed decisions regarding your eye care. Dr Murphy & Dr Bartels specialize in all aspects of eye care including comprehensive eye exams for children and adults, fitting of contact lenses, and the diagnosis, treatment & management of most eye infections and diseases. Our doctors and experienced staff ensure that every patient receives the highest quality eye care possible. We are consistently given top marks by our patients as we strive to make your visit pleasant and quick. Absolutely the best eye care in Western New York. The only doctor I've ever gone to where my glasses and contacts are fit correctly the first time! Support staff is friendly and knowledgeable. Make an appointment! The staff and Dr. are amazing from start to finish. I already recommended them to several people. The exams are thoroughly explained as well as any insurance questions. Everything was done promptly and professionally. The customer service was outstanding. Thanks. The associates and doctors at Clarence Eye Care always go above and beyond. They've created a welcoming atmosphere, deliver the best customer service, and are extremely knowledgeable and able to answer questions in terms that someone without a medical background can understand. I originally found them by accident, but I cannot imagine going anywhere else when it comes to my eyes. Email: Please use the above form to email us.